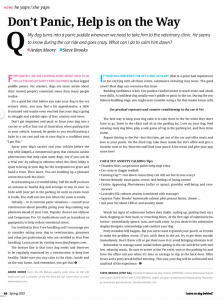 Q: My dog turns into a panic puddle whenever we need to take him to the veterinary clinic. He seems to know during the car ride and goes crazy. What can I do to calm him down? If your dog perceives the vet clinic as scary (due to a prior bad experience) or too exciting with all those scents, submissive urinating may occur. The good news? Most dogs can overcome this issue. Building confidence is key. Use positive reinforcement to teach tricks and obedience skills. A confident dog usually won’t piddle or panic in the car. During the confidence-building stage, you might even consider using a Vet that makes house calls. The best way to keep your dog calm is to take them to the Vet when they don’t have to go. Drive to the clinic and sit in the parking lot. Love on your dog, feed amazing tasty dog bites, play a safe game of tug in the parking lot, and then drive home. Repeat driving to the Vet—but this time, get out of the car and offer treats and love to your pooch. On the third trip, take them inside the Vet’s office and give a favorite treat or toy. Have the staff feed your pooch A-list treats and give your pup some love! Watch for signs of submission before they tinkle: curling up, putting their ears back, flopping on their back, or crouching down. At the first sign of submissive behavior, immediately ignore, turn, and walk away. As you observe the submissive display dissipate, acknowledge and comfort your dog. Potty mistakes will happen, but you never want to punish your pooch, as it tends to make the problem worse. If you catch them in the act, try to get them outside immediately. Don’t throw a fit or put their nose in it; avoid bringing attention to it! Remember to manage water intake before getting in the car and drive with mellow, relaxing music. Be sure to arrive at the Vet early, wait in the parking lot and have the office call you when it’s time or arrange to slip in the back door. Offer treats and a potty break before entering. This way, your dog will be acclimated and unafraid of the experience.